When you frost a cupcake, you spread love. Cupcakes are a great treat for all kinds of parties! Easy to decorate with cute picks and no worries about taking serving utensils for divvying up the goodies! One of my favorite products is our cupcake picks. Talk about one stop shopping! Liners for cute serving containers and picks for easy decoration! It’s so much fun to bake and decorate. You can ice the cupcakes, throw on some sprinkles and place the pick in for a festive look! And so economical! Easy cleanup is a big bonus as well! No slicing up the cake, worrying about who gets the most frosting, who gets the corner piece and how in the world are you going to fit the leftover cake in the fridge. Our Froggie Cupcake Picks were perfect for a Frog Prince themed event. The cupcakes were iced with blue-green frosting and then we piped on green lily pads. It’s so easy to get carried away with your theme and have such fun creating decorations, food and of course the cupcakes! 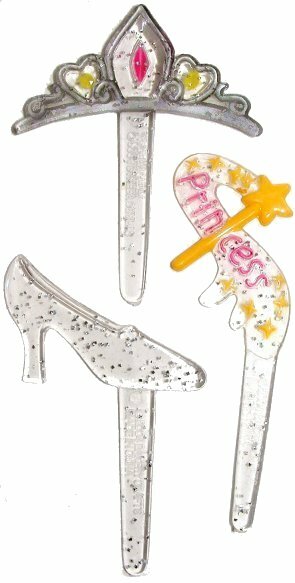 If you have, or are, a girly girl, you will love our Princess picks. .
Aren’t they adorable! And they are washable, reusable and work for princess tea parties too. Our last princess party (which may very well be the last as she seems to be outgrowing the little girl fun and heading toward pre-teen angst) was geared toward Cinderella and each girl received one of the Cinderella Slipper Fillable Favors in her goody bag. Cupcakes just make this over-scheduled mom happy. The baking and decorating process gives us the time to just relax, take time out of our busy day and share in family time. The easy serving and easy clean up gives you the time to sit back and enjoy while the party is going on. Share your cupcake tips, pictures or stories with us! Have you used our picks to decorate? Leave us a picture. We love seeing the parties and events that our customers share with us!